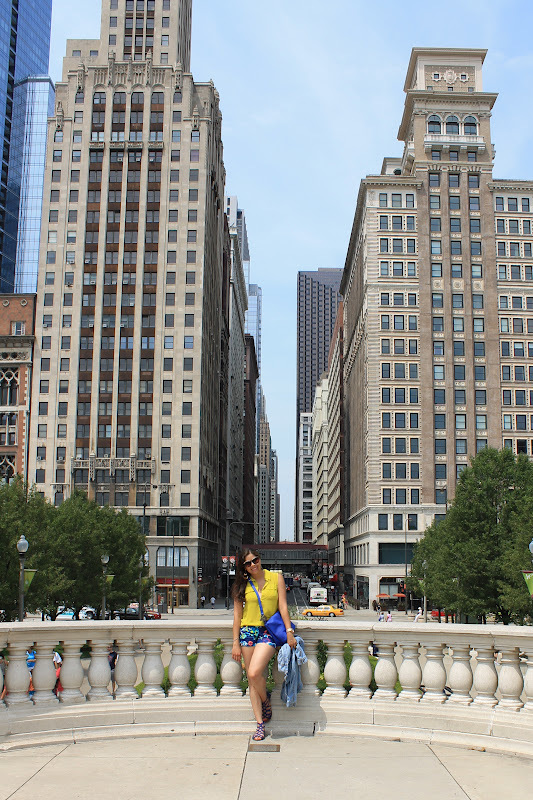 My anecdote to staying fashionable and comfy while walking a gazillion miles in the 90 degree weather of Chicago was 1) bright clothing 2) sheer sleeveless tops 3) printed shorts 4) gladiator sandals. You will also notice that I am carrying around a useless jean jacket (boo!) From this I learned: if the forecast says high 90's, you better believe it and leave the jacket at home! I absolutely adore your outfit! I love the top and those shorts -- it makes me want to go to Target! Haha! Love the bright gladiators, too! I love Chicago. My husband is from there, so I used to spend summers there and boy - is it hot, complete opposite of their winter, which is too cold. HAHA! Anyway, love the day time and night time changes in the outfit. :) Take care! You look so pretty! Lovely photos! Oh wow, what gorgeous photos! The best part of them HAS to be your outfit! I love it! Especially those shorts - they are just stunning! I hope we'll get to see what you bought in Chicago! The signature room has the most amazing views, even the bathrooms have awesome views! I love that top with the target shorts! Looks like you had a blast! I love the shorts so versatile! aww boo!! Threadflip should definitely open it up! I would love to shop your closet too! You look so pretty in the yellow! That's your color! Looks like you are wearing the perfect sightseeing outfits! I'm totally following you now! both outfits are fab love the yellow top and shoes! I have never been there but it is def a place I want to go with the hubby! Looks like you had fun! Check out my latest tutorial All American Inspired Look! 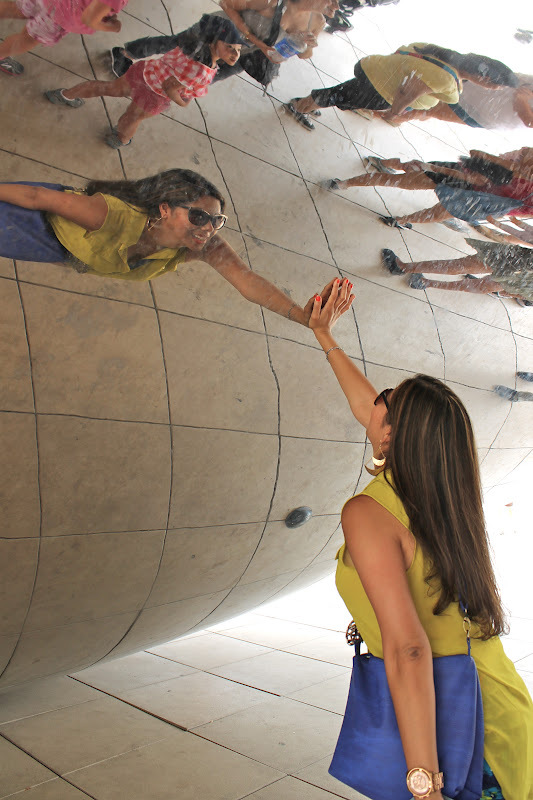 Your pictures really express how much fun you had in Chi town. Thanks sharing with us. Also love that you had a morning/night look with your F21. It's true that with different accessories you can make a piece look very different. Thank you for your comment in my blog! I'm following you now and then I'm waiting for you too! 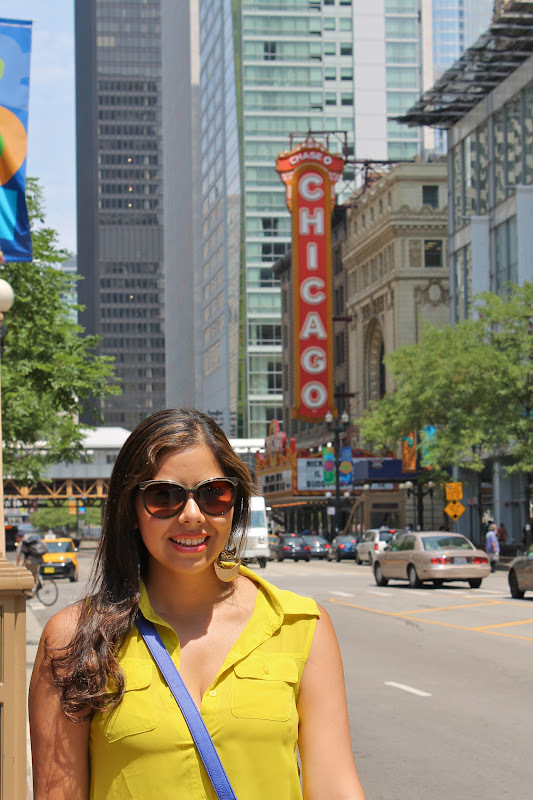 You look soo stylish Pau and I love how you went with bright shades (plus your style tips for Chicago in the summer are perfect) I was there the same time a few years ago and I remember it was so humid, I went to a lot of the same places you did like the classic Chicago sign. You're doing a great job as a fashion blogger/tourist there. Nice outfit in a wonderful place! Love it! 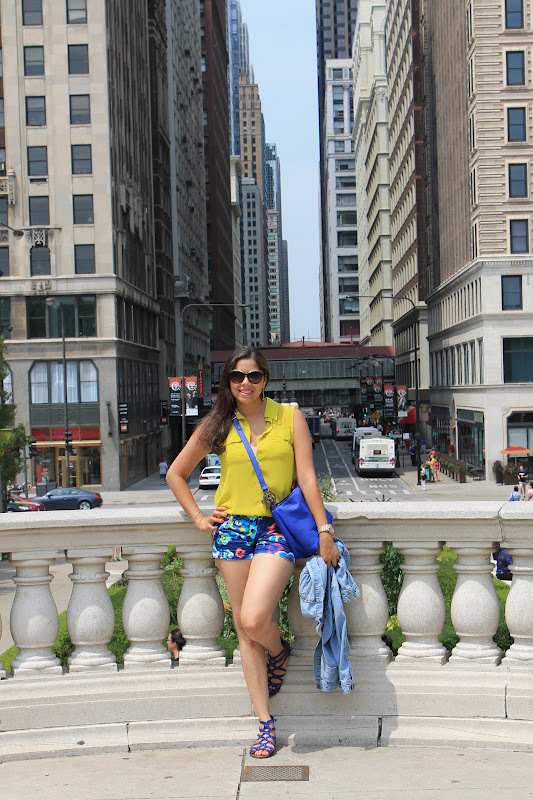 Mendi went to Chicago last summer and totally fell in love with the city! Glad you had so much fun! You look so great in both outfits, love the colors of the first. Loved to see the yellow and blue together. The heat was crazy here (I live in Chicago). I can't believe you did all that sightseeing and you did it with such great style. I love the daytime look! Those shorts and sandals...so fun! Awesome outfits! Your top, bag, and shoes go so perfectly with the shorts. Hope you're having fun in Chicago! 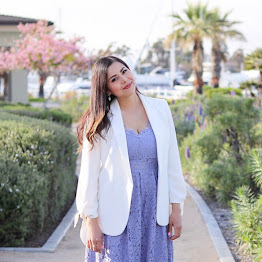 your blog is beautiful and this post is very interesting! Pau!! thos black shoes are to die for!!! Marshalls??? I can't ever find stuff like that!!! tell me which one! Pau! me encantan tus shorts! los quiero YA! Amazing outfit... Love your shorts and the yellow night time blouse. Cutest shorts ever, pretty colors.